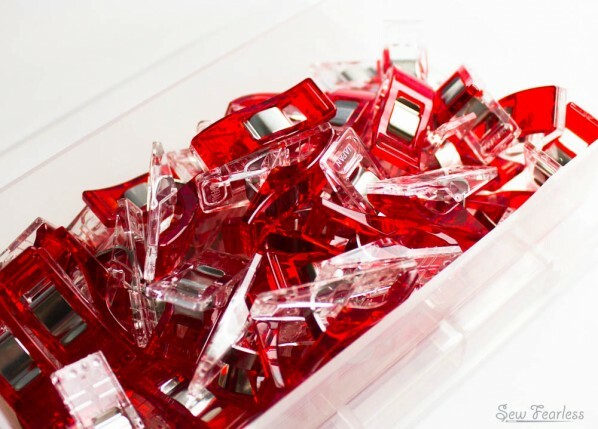 The Shiny Factor – Opening a box of Wonder Clips* is like opening a box of shiny glowing jewels. Wonder Clips are puuuuuurty. Let’s just stand up and admit it. k? We sewists love our rainbows of measuring tapes, our floral handled shears, and our aqua rotary cutters. We are visual people. There is no shame in wanting our tools to be as lovely as the things they help create! The Fumble Factor – I found it a bit easier to take the Wonder Clips on and off. Binder clips tended to spring out of my hand when I tried to open them. Or maybe it was just me? Even so, Wonder Clips won in this department. 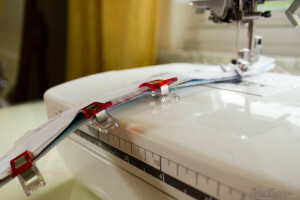 The Smooth Feed Factor – The flat bottoms of the Wonder Clips don’t catch on the corner of the machine bed while you sew. This is, hands down, the biggest advantage Wonder Clips have on binder clips. Compare the above photo with the one below to see what I mean. 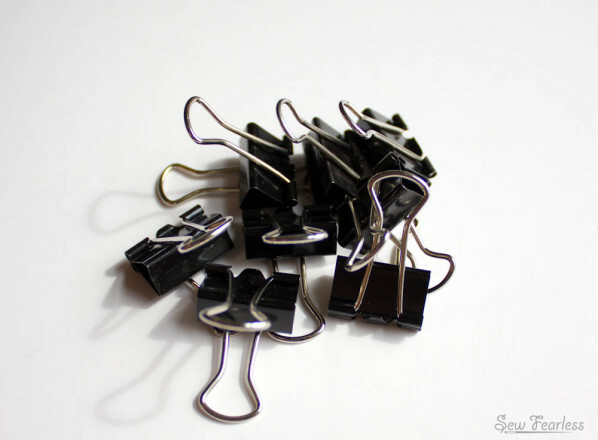 The Price Factor – Binder Clips typically cost less than ten cents a piece. Compare that to Wonder Clips which range from 30 to 60 cents depending on the size of the package. If my sewing budget was tight and I had to choose between fabric and Wonder Clips, I would choose fabric. 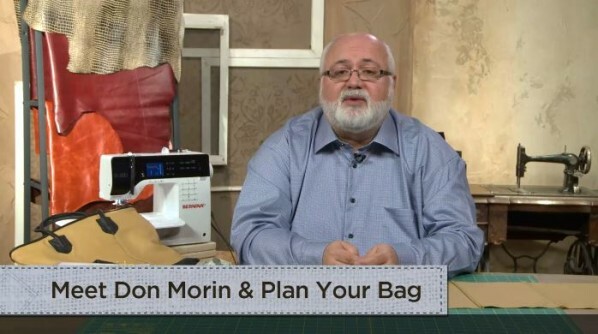 The Pro Factor – I am working my way through “Making Leather Handbags” with Don Morin. He uses specialty tools I had never heard of, like a “nylon brayer” and a “skive”, but Don busts out the binder clips to hold many thick layers together. If its good enough for the industry pro that writes “Bag’n-telle“, it’s good enough for you. So which one wins? 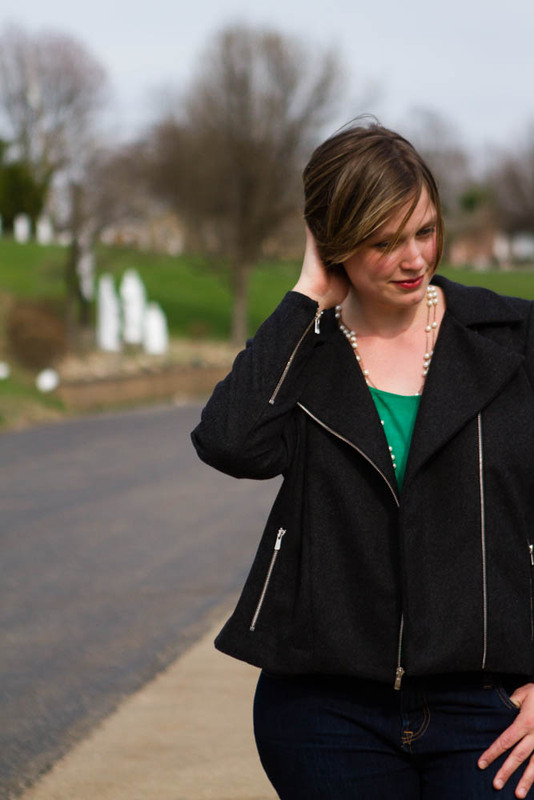 It really depends on the size of your sewing budget, and how often they would be used. If finances are tight, binder clips will get the job done. However, Wonder Clips* could be a fun, pretty, and useful addition to your sewing stash. I am happy I have them in mine. Are you on Team Wonder Clip? Or Team Binder Clip? *Dislcosure: I was not paid or compensated for this review in any way. All opinions and content are my own. Links denoted with an asterix (*) are affiliate links. I like to use the flippy hair clips instead of either choice. 🙂 Not sure what the actual hair clip is called but it is the one that you bend back and forth to open and close. Cheap, colorful and easy to use. Me too (and no, I don’t know what they are called, either). I feel that they are more gentle with the fabric. On the other hand, I’ve used binder clips to hang quilts from wall hooks, when I am too lazy to sew on something more permanent, or I’m worried about the beadboys tugging on the quilts. I have them in pretty colors, too, so I can coordinate with the fabric! If you search for “snap hair clips” you will find what you are looking for. One other difference between the two, at least with the binder clips that I use, is that binder clips have a slight gap where they close so you can’t get a good secure hold if you’re not working with enough layers. Anything below the thickness of about 4 layers of quilters cotton? Forget it, grab the wonder clips. Team binder clip! If only because I already have a million of them in a bunch of different sizes (left over from my abandoned career as a lawyer), and I am loathe to spend money on the Wonder Clips if I have clips that will work nearly as well already. The Wonder Clips are super cute, though! Of these two choices I’d like the Wonder Clips because to me the only con is price. I have decided that tools are worth it to me, and I’d rather have great ones and cut back financially someplace else. We all make choices. For me it’s skip haircoloring and go quilting. But I completely understand somebody else’s perspective. Binder clips are multi-taskers, cheap and easy to find anyplace. I haven’t got any Wonder Clips yet, and have always loved the plain metal hair barrettes Erin mentioned for binding. But maybe I’ll experiment with them for some pinning applications. I certainly have every pin on the market, and I can see where maybe the clips would have been a better choice to use when teaching my daughter and her friend to sew pillowcases recently–no stuck fingers and no worries about them in the carpet. My daughter’s friend the athlete decided she hates sewing, but she stuck with the project so I’m proud of her. However my girl loves and it wants to progress, which is thrilling to me. Wonder clips! I wanted them for years but didn’t want to spend the extra money. Not long ago the 50 pack was super cheap on Amazon so I ordered and have loved them from the start! 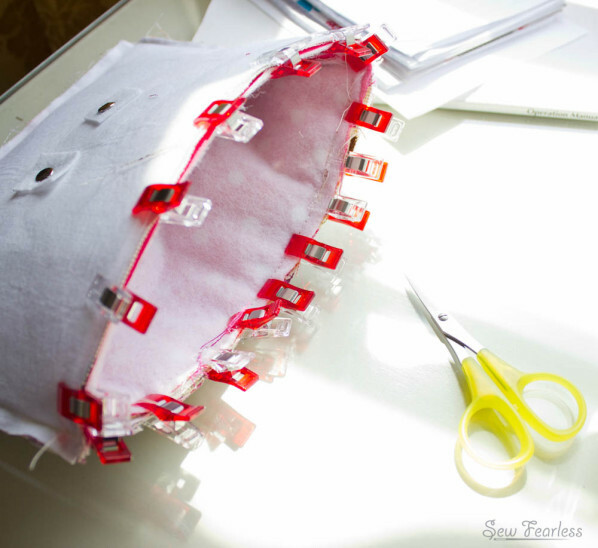 I’d never heard of Wonder Clips before I saw this post linked from the Make blog and it had never occurred to me to use any kind of clip for sewing – duh. 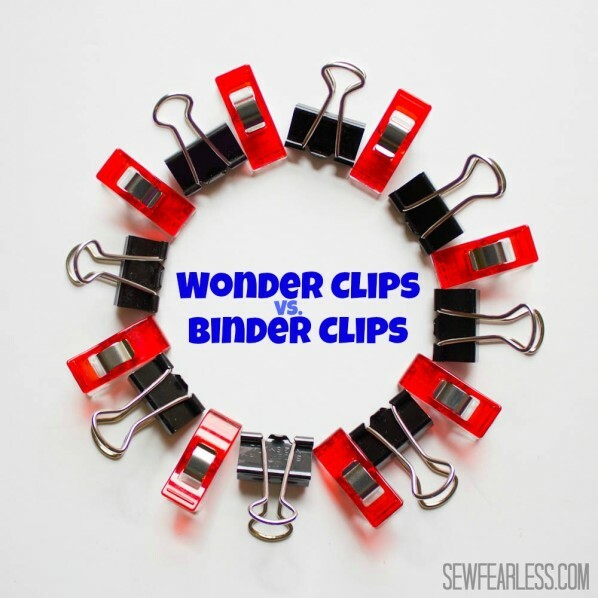 I’ll be looking for Wonder Clips but binder clips will still hold a place in my heart, not to mention all over my house. The reason Don Morin probably uses the binder clips is this: when working with very heavy material, it stretches out the clips. I do custom nylon gear for a living and it is not uncommon to be putting 4 layers of heavy weight nylon (made for tactical gear and back packs, not the thin ripstop) and 2 layers of Velcro at a time – I throw out a LOT of stretched out binder clips. If I was working on normal weight materials (i.e. garment weight leather) I would go for the Wonder clips but if what you are clipping is more than 1/4″ thick, go with the binder clips. binder clips- not frequently used enough to warrant the pricier product! Though I love binder clips, I have fallen in love with the Wonder Clips. It helped that I had a 60% off coupon at the craft store, and the clips have measurement markers on them. I never understood the pull of wonder clips, until I used them for hand-binding recently for the first time. I had never really liked the metal kind or gotten them to work right. The wonder clips made the whole binding process faster and easier, and saved my hands from aching. leatherpartials with excellent prices & customer service. (No, I don’t work for them). I just bought an 8′ piece of red & a 6′ piece of black and they combined the shipping for me so it was only $45- that’s w/ Priority shipping! They were so nice that I had said could you fit it all in a large flat rate box & they said they would fit it in a medium, which is what they use for only one hide. I actually wanted some spare black to try to do other things with. I just thought I’d fill you in on this $ saving tip I learned. Great site BTW. Take care. P.S. If you add Wonderclips to your shopping cart on Amazon.com & then save them for later & check every so often you can get them for rock-bottom prices. Just watch out for the shipping. Oh, and always check the Used section first because that is where the Amazon Warehouse deals are. They are the best! Never got a bad product from them. Worst thing I ever rec’d were Post-it notes that were not in their original bag! Oh, the horror ; )! Def. worth checking first. Lastly, just found out last night that Amazon has TONS of coupons for you to e-clip for things one would actually use. Wonder clips all the way! But for what they are – very expensive. Because they are so small i keep losing them. i honestly have about four left.. and i find them in random places around the house too! Thank you for this post! I had seen the Wonder clips online and just didn’t see what made them so special. Then I saw the price in store and REALLY didn’t see it! But laying flat while going through the machine is definitely a big difference. I purchased my 50-pack of Wonder Clips on Amazon for less than $15. They are SO SO worth it! I make a lot of bags, wallets, zipper pouches, etc. and they are so fabulous I don’t know how I lived without them. They are so much gentler on fabric, too. I just found Weekend Designer… Thanks Don, for returning, and helping the rest of us. I will be watching both blogs now. As for binder and Wonder? I have always used binder, with what I have read here, I will be watching Amazon for their pricing. Thanks to all for your answers, I think it’s time for me to give wonder clips a try. Just found 100 count wonder clips on Amazon for 8.99. That’s cheaper than the binder clips right now. I have used binder clips and with leather and vinyl they tend to leave a bit of a mark/indent. I have also found they can catch on the machine when I use them. I have one comment as a pro-binder clip person though….SIZE. When I use them for embroidery or quilting, I use the giant binder clips to hold the bulk of my project out of my way then use tape, pins and smaller binder clips for the small stuff. 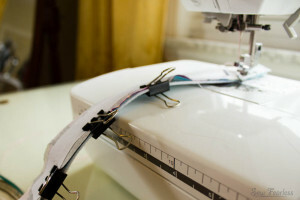 I am hoping to use wonder clips for regular sewing since my straight pins keep migrating to someone else’s work area. Do they work for regular garment sewing? I buy Wonder Clips from eBay (China) and pay under Aus $5 for 50 clips including postage. I have to wait a little while but at that price it makes me very happy. Also giant wonder clips by the dozen for under $4 Australian, again including postage. I think the wonder clips win hands down. I never liked the metal of binder clips hitting my sewing machine and also found they would fly away at will.